Titanfall has had critical appeal and reception since its reveal at E3 last year, but does this fanfare have merit, or is it a gust in the wind? Given the amount of hype TitanFall has received since its debut at E3 last year, I had to give the game a go on release day to see what all the fuss was about. Without thinking, I slammed £25 into the Origin edition from CDKeys.com and preloaded it onto my machine days before launch. With a download size of 50GB, and a host of games sites going crazy for its imminent release, I hoped the money was worth it. After 42 hours of game time later, I suppose I can say that I have a few opinions on the game, and whether you should purchase it or not. First up: TitanFall is a multiplayer only game, and although it comes with a campaign mode, it’s little, if anything worth mentioning. 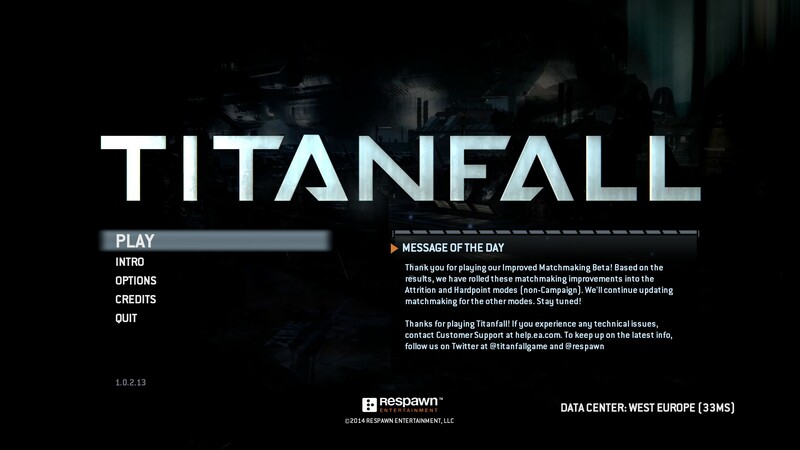 Upon starting Titanfall, you’re greeted with a main menu which has very few options. Pressing start brings you to another menu asking whether you want to start campaign, or start classic. Whichever option you choose makes little difference; one takes you to a multiplayer game with 30 seconds of audio logs and 15 seconds of pre-scripted animations before a match, the other just takes you straight into the match. The campaign is abysmal, with each stage concluding in a victory or defeat regardless of what you’ve done in the actual match, meaning you play no part in the world at large. Unfortunately, the campaign needs to be played in order to unlock the meagre 3 types of titans you can play as, meaning this is the only necessity in the game. For a full priced game (currently £45 on Xbox One), this is some of the worst value in the industry, but that’s relative to whether you spend time on multiplayer or not. All maps are of similar size, with plenty of walls to run across and places to hide. Streets are always wide enough for Titans to navigate, with each level offering plenty of opportunities for pilots and Titans alike. The matches themselves are what you’re here for, with the control scheme and game mechanics working in perfect harmony to create a fun and dynamic multiplayer experience. 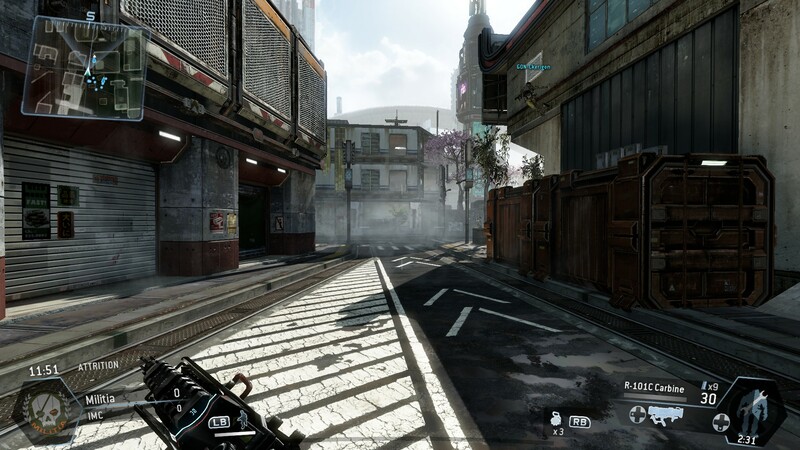 The matches play out similar each round, with teams starting on opposite ends of the map and meeting in the middle for a firefight. After about a minute or so, Titans start falling from the sky as players have earned the right to manoeuvre them. These hulking machines of metal, tower over enemy players, allowing you free reign of any robots or npc’s you may happen upon. Encountering other titans mixes the typical combat up, with titans taking a bigger beating than any normal solider would, and having special abilities like missiles that lock onto enemies or forcefields that repel enemy fire. The dynamism comes into play around the time a few titans have been killed and most players are back on foot, as it gives a new element to the combat: pilot v titan action. Titans are terribly overpowered, but to make up for this, pilots run and manoeuvre faster than a titan can keep up, ensuring a balance is maintained. Pilots also have the ability to double jump and wall run, giving a parkour feel to an otherwise static shooter. It can be said that you won’t die the same way twice, which certainly speaks volumes to TitanFalls ability to mix up the way a match plays out. Throughout these matches you’ll meet NPC’s that are generated and controlled by the server, meaning none of the AI is being processed by your local machine. It means you can have hundreds of characters on the screen at any given time, making the stages a lot more epic in scope and scale, with the exception that the AI aren’t intelligent and don’t substitute for real players. They’ll group up together, have lower health, and generally don’t do too much damage to you, making them great cannon fodder for your kill streaks. There are times that I feel the AI were put in the game to fill the gap that the lack of real players couldn’t fill. With it’s small match size (12 players total, 6 V 6) the AI may have been a necessity to overcome the sheer size of the maps with a limited amount of players, ensuring you’re always coming across something to kill. On the other hand, they feel intentionally dumb and satisfying to kill, meaning coming across a drop pod of them brings glea with the amount of kills you’ll now be able to accomplish. Whether the AI were put in to make the maps feel epic, or whether they were put in as a game mechanic is down to you, but regardless on how you feel about the AI drones, they’re here to stay, so you had might as well slaughter them either way. 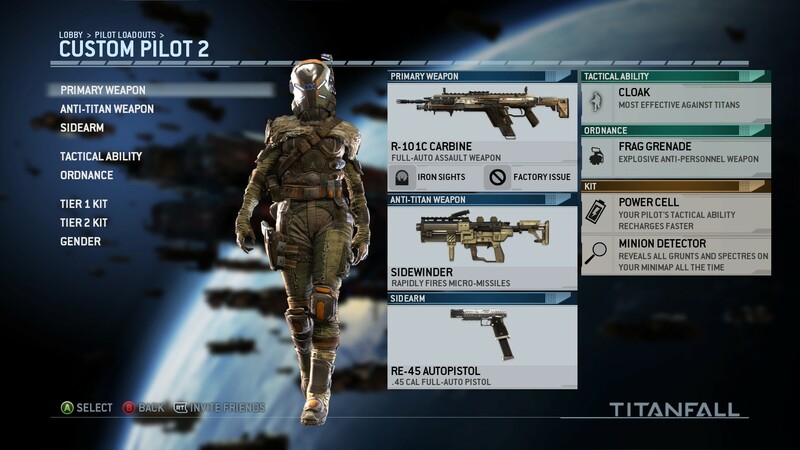 One new mechanic that has been added to TitanFalls gameplay is its addition of burn cards. Burn cards a temporary buffs to your character throughout one life. These buffs range from the mundane (like being able to hear an enemy near you) to the extraordinary (like summoning a titan when the game first starts). You can hold three of these cards in each match, which both ensures players aren’t too overpowered, and makes you reserve card uses until the opportune moment. Your pilot and titan class can have a big effect on how you play each match, with each weapon starting off basic until you use it more. Each weapon also has challenges associated with it, meaning you’ll want to alternate between weapons to get the most XP in matches. After each round, you’ll earn your XP, and level up, unlocking more weapons and titan abilities to progress up to the almighty level 50, a level so famed that you need to trade it in ASAP to get a new badge next to your name. That’s it. That’s everything your playtime has got you: a badge. Your second time through will also earn you more XP in each game (1.1x more for 1st regen, 1.2x more in 2nd etc. ), but all this does again is give you another badge that looks slightly different. It’s a shame that the game doesn’t offer anything in terms of extra story or narrative for your achievement, but from the makers of Call of Duty, did you expect more? Thankfully, I’m a competitive person, so this is all right up my street. I want to be the best of all my friends. I want annihilate them, so I continue to play. But for those of you who aren’t into this and are looking for a game to tackle new subjects or have a deeper meaning and better you as a person, TitanFall isn’t going to do any of this, and is instead a refinement of a old and stagnated genre of games. So for those of you who never touch the multiplayer part of a game, TitanFall probably holds little to no value for you. But, if you’re the type of person that revels in the multiplayer sections of Call of Duty, and buy it exclusively for that alone, you’ll have the time of your life. The lack of a proper story makes the game feel like half of a game, and even the half that’s included feels devoid of content with only 3 titans and 15 maps, and 6 game modes to choose from. One day this may be resolved, but given numbers alone, TitanFall doesn’t offer much in terms of value. Where the value comes is in the dynamism and replayability, with my time invested already clocking in at 42 hours, it doesn’t look like this is going to end anytime soon.